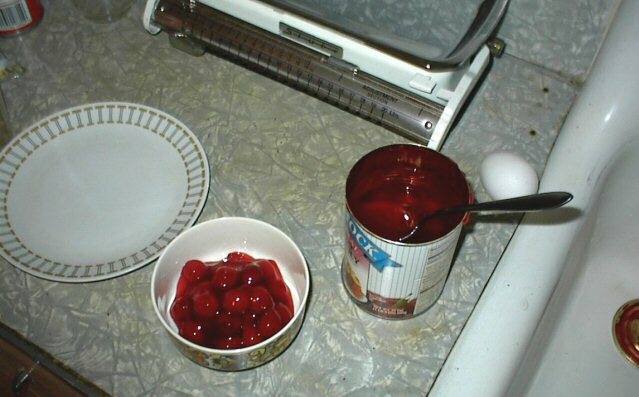 The most tedious step in the recipe is fishing the cherries out of the corn syrup goo. You want to discard at least half of this goop. Then preheat the oven to 400 degrees. That preveous step was eliminated when I got this collander. It has 4mm holes. 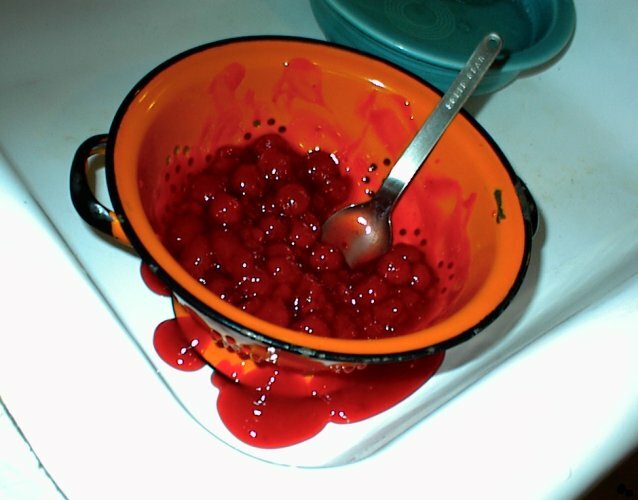 Just push the cherries around a little and the goop drips into your sink. I have not tried this with a strainer that has smaller holes or wire mesh! 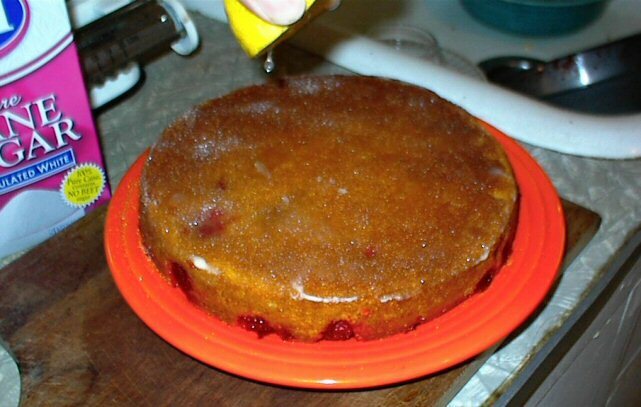 Grease the bottom of an 8 inch (20cm) cake pan. 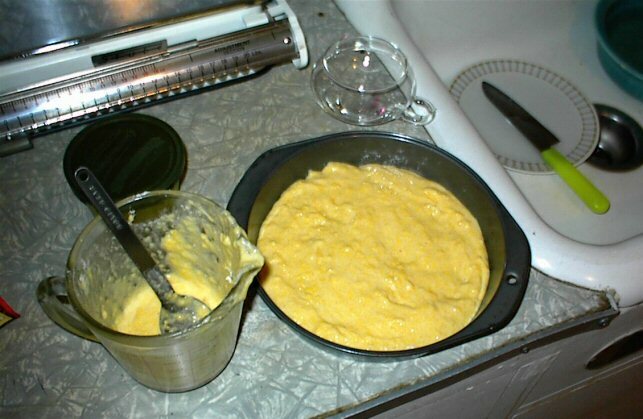 Prepare the corn muffin batter as directed on the package but, you want it a little runnier than for normal cornbread so use a little more milk. Don't mix it too much, there should be small lumps. 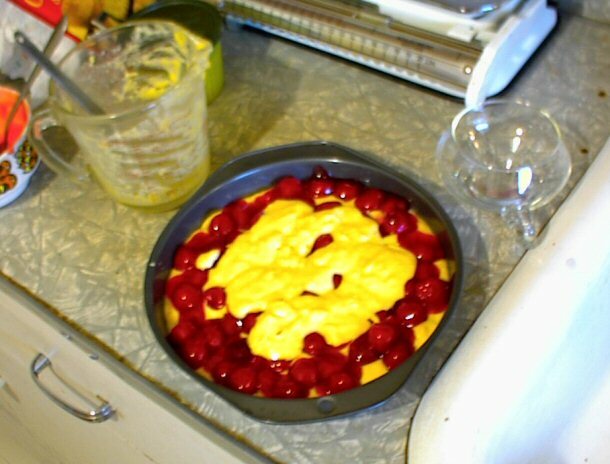 Use about 3/4 of the batter to cover the bottom of the pan. 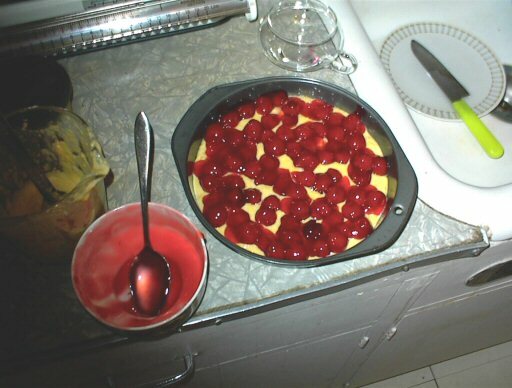 Plop the cherries onto the batter. Don't push them down or drop them from a great height. Spoon the remaining batter into the middle of the pan. The purpose of this is to avoid an unsightly concavity when it's turned over. Bake at 400 degrees for the recommened time plus 5 minutes. This one was in for 24 minuites. It should be nice and brown. When it's cooled enough to handle, run a knife around the edge of the pan and turn onto a radioactive plate. Butter the top. When the butter has melted, sprinkle with granulated sugar. Saturate the sugar with the juice of half a lemon and viola! 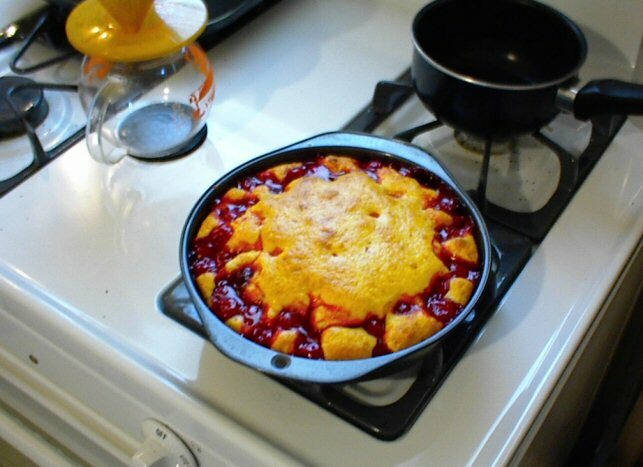 CHERRY CORNBREAD. Serve with espresso con panna.